We can only find these great Japanese Turnips at our Farmers Market. They alone are worth the vsit, though we always seem to come home with our arms filled with the freshest, just-picked seasonal vegetables. 1. Thoroughly wash & scrub clean the Turnips. Carefully wash away any sand or grit on the Leaves. 2. Snip the Turnips, leaving about an inch of the stem attached, & cut the Leaves into 2-inch pieces. Place the Turnips & the Leaves in separate bowls. 3, In a soup or pasta pot, add the Turnips & enough water to cover. Parboil for about 4 minutes or until the point of a knife can easily penetrate them. 4. Remove & drain them in cold water. Place them in a bowl. 5. Heat a deep sided pan to medium, add 1 TB of Olive Oil, 1 sliced Garlic Clove & a pinch of the Red Pepper Flakes. 6. When the Garlic has lightly browned, add the dampened Leaves & saute until wilted & tender. if they begin to look dry add a few ounces of water & saute for another minute. Remove to a bowl. 7. Add the other 1 TB of Olive Oil & the remaining Garlic to the same heated pan. 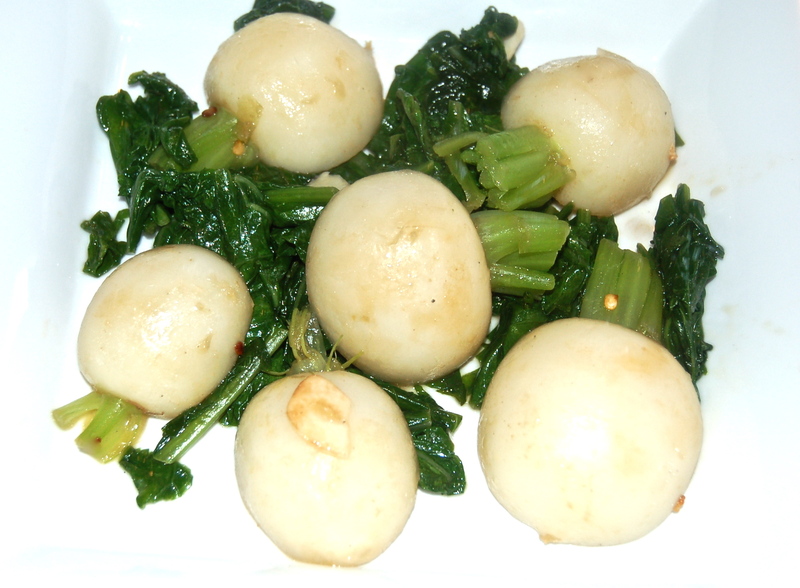 When the Garlic has lightly browned, add the Turnips & saute them, tossing occasionally until they are tender. Return the Leaves to the pan & toss it all together. Adding the extra TB of EVOO to the finished dish is suggested.